Ball Spline | Products Lineup | Products | NIPPON BEARING CO., LTD. The NB BALL SPLINE is a linear motion mechanism utilizing the rotational motion of ball elements that can sustain loads and at the same time can transfer torque. It can be used in a wide variety of applications including robotics and transport type equipment. The NB BALL SPLINE consists of a spline shaft with raceway grooves and a spline nut. The spline nut consists of an outer cylinder (main body), retainer, side rings, and ball elements that are designed and manufactured to achieve a reliably smooth motion. The raceway grooves are machined to a radius close to that of the ball elements. The large ball contact area results in high load capacity and long travel life. Since a round shaft with raceway grooves is used, NB BALL SPLINE shafts can be machined easily to customized specifications. 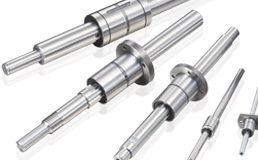 Spline shaft sizes with diameters from 4mm to 100mm are available. Several types of spline nut are available: cylindrical types (SSP/SSPM), flange types (SSPF/SSPT ), and block type (SSPB). Material option of Stainless steel (SUS440C or equivalent) is also available. They can be specified to suit various applications. Due to the effective contact angle between the raceway grooves and the balls, the NB BALL SPLINE can transfer large torque. By adjusting preload it is possible to give a higher rigidity and a higher positioning accuracy. The outer cylinder is compact and well balanced, resulting in good performance at high speed. A wide variety of spline nut designs are available and all spline nuts come with side-seals as a standard feature.